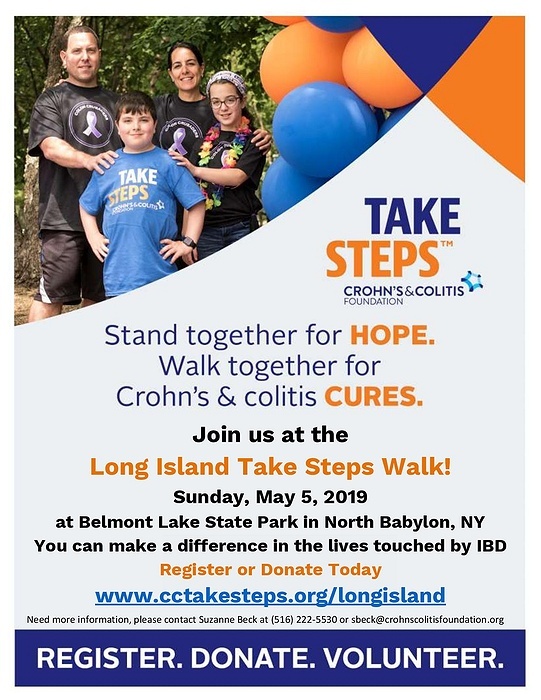 Subject: LongIsland.com - Your Name sent you Event details of "2019 Long Island Take Steps Walk"
Register a team, donate or volunteer today. *Volunteers are needed to assist with registration, set up, food tents and more! Contact Melissa at MPulsinelli@crohnscolitisfoundation.org or 516.222.5530 to volunteer or for more information. Want to walk with your family? Register for the walk today! Our Mission: To cure Crohn's disease and ulcerative colitis, and to improve the quality of life of children and adults affected by these diseases.